Using the right badminton strings is absolutely essential in maximising your performance to win games. Besides performance, choosing the correct strings is important as re-stringing your racket can be very costly. I’ll suggest some badminton strings which I find good and cost effective. Different types of strings serve different purposes during a badminton game. Therefore, choose the string that suits your playing style. You might also want to get advice on string tension as it also affects your performance. Common badminton strings’ diameters range from 0.65mm to 0.70mm. Strings with diameters outside the range of 0.65mm to 0.70mm are not very popular. Repulsion is the degree in which the shuttlecock can bounce off the racket string bed. High repulsion provides more power into your badminton shots. The shuttle bounces of quickly. Low repulsion simply means less power in your shots. The shuttle stays on the string bed longer before it bounces off. Sweet Spot is a specific area on the racket string bed. When the shuttlecock makes contact with this sweet spot, you get maximum power for your shots. The sweet spot on the string bed gets smaller and smaller once you increase the thickness of your string. When the sweet spot gets smaller, it’s not a bad thing! Despite having a smaller sweet spot, if the shuttle makes contact with that smaller sweet spot, the shot will be very powerful! However, it requires good skill and technique to make contact with the smaller sweet spot. 0.68mm or 0.69mm should be the thickest strings if your objective is to generate maximum power. Strings thicker than 0.69mm are for players seeking durability. It is almost impossible to generate power with strings thicker than 0.69mm. Ok let’s begin with the various popular strings. Yonex has a wide range of strings for you to choose from. In terms of quality, I personally think that Yonex owns the technology to produce the finest quality strings in badminton. 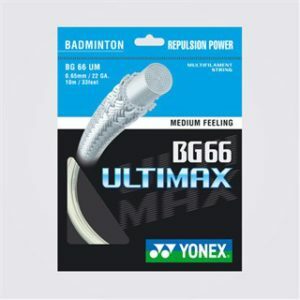 The Yonex BG66 is the MOST POPULAR string FOR POWER among players and fans. The Yonex BG-66 Ultimax is an improved version of the BG 66. The BG 66 strings provide good power (high repulsion) but lacks durability. The BG 66 Ultimax is MORE DURABLE than the BG 66. Both BG 66 and its Ultimax version have equally high repulsion. To me, the BG 66 Ultimax is definitely a better string compared to the BG 66. But why is it not as popular? One word… price! Besides the increased durability, I find the BG 66 Ultimax to be the best strings for SLICING. Slicing is a common advanced technique. It is commonly used to perform shots like the cross court drop shots (slice and reverse slice), deceptive cross court net shots, and so on. Slicing with the Ultimax gives me a nice feel for the power. Sometimes when you over-slice, the shuttle can’t travel far enough. With the BG 66 Ultimax, you can FEEL the power as you slice. In other words, you can concentrate more on technique! You don’t have to worry whether the shuttle will pass the net. The BG 66 Ultimax is very expensive. In fact, its one of the most expensive Yonex badminton strings. If you’re seeking for maximum performance, consider this investment worth it. The Yonex BG-80 is a thicker string compared to both the BG 66 strings. It has a more concentrated sweet spot. The BG 80 is for consistent performers and who are familiar with their rackets. This is because it is a relatively thick string, that equates to a smaller sweet spot! The concentrated sweet spot injects a lot more power into your shots when the shuttle makes contact with it. I personally favour the Yonex BG 80 for POWER. Since it’s a thicker string, it is also more durable. You can produce more accurate shots compared to using the thinner strings. However, these strings won’t be good for slicing. If you are an intermediate or advanced doubles player, the BG 80 is perfect in helping you launch powerful shots from the back of the court. Peter Gade uses the BG 80 at 34lbs of tension! It is very difficult to generate power with the Yonex BG-65 string. This is because of its thickness and its extremely small sweet spot. However, you will be able to produce more accurate shots. 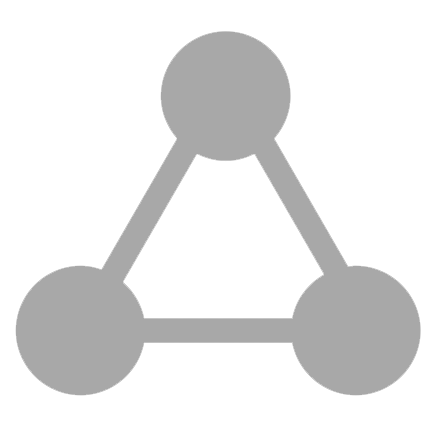 It is also extremely durable, which means that you can save a lot of money on your stringing. If you are a woman and play mixed doubles, this might be a good string for you because most of the time, women engage in technical and control shots. This string is perfect for precision play. English mixed doubles player Imogen Bankier uses the BG 65. Beginners should stay away from this string because it really is difficult to produce power with these strings. If you try to perform a full power smash with this string, you’ll waste your effort. I suggest using the Yonex BG-66 because it has high repulsion. Beginners can concentrate on performing correct techniques rather than focusing on power. The high repulsion of the Yonex BG 66 badminton strings will ensure there is enough power. But take note, the BG 66 is not that durable. So make sure you perform gentle strokes; which is the fundamental of good technique; even if it’s a smash! When your skills improve and as you start injecting more power into your shots, consider switching to the Yonex BG-66 Ultimax for increased durability.